It’s great to get out of my own studio and take a workshop to learn new skills or a new process. I prefer short, intensive one-day workshops as opposed to multi-day workshops because they don’t intrude upon my regular studio work. About two weeks ago, I participated in a 9:30 AM to 3:30 PM watercolor-batik workshop offered by artists Sally Browning Pearson and Cynthia Head. I learned about the workshop through The Rickie Report. In my workshop group the experience level of participants included seasoned watercolorists, watercolor painting students to individuals with no painting experience. For the designs, Cindy and Sally offered patterns or the option to create your own design. I decided to work with my own design and came prepared with a drawing of a figure in Eka Pada Rajakapotasana (one legged king pigeon yoga pose) with a simple mandala background. The workshop took place in Sally’s well-lit Port St. Lucie studio. Each of the 6 participants had ample space to work comfortably. The project began by drawing the image on rice paper that is shot through with Mylar threads. I don’t want this article to give away too many secrets of this wonderful process, but there was a point when I was nearly finished, the entire piece was coated in wax and I was instructed to take my work outdoors and crumple it into a little fist sized ball. I had been handling my artwork very gently during the entire process. Crumbling it into a tiny ball was extremely counter-intuitive and scary! After the crumbling and another watercolor wash, I ironed the artwork to remove all of the wax. The results were delightful. 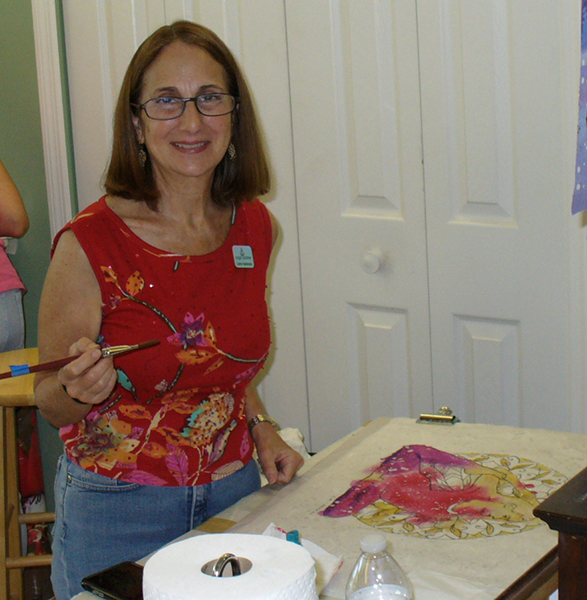 Each workshop participant adhered their rice paper art to a 16” x 20” stretched canvas support. I elected to skip this stage because I wanted to attach my watercolor batik to a canvas scroll, as I’ve been doing for all my YogaPainter artworks. I’m please with how this piece came out and am planning further yoga inspired watercolor batiks.